I do love the Today programme on BBC Radio 4, but when it comes to stories about science and technology or popular culture the presenters can be exasperating. This morning John Humphrey kept calling Philae the “Mars explorer” and seemingly no-one noticed or dared to correct him. Then he introduced an item allegedly about some new photographic technology, a “great technological breakthrough” he called it, related to taking selfies. (Listen to the clip). This was the cue for his retreat into bumbling confusion – his stock response to any technology introduced since about 1990. I was a bit surprised therefore when he announced that they were talking about selfie sticks. I first saw them in use while on holiday in the Philippines in May this year. On our trip to the island of Corregidor (a must-see for anyone interested in the history of the second world war) another person in the tour group had a selfie stick and took countless photos of herself and her boyfriend in various poses with the historical ruins and gun emplacements. Intrigued, we purchased one when we got back to Manila and found that it was really useful for taking photos with your camera phone – not just selfies but all kinds of things. 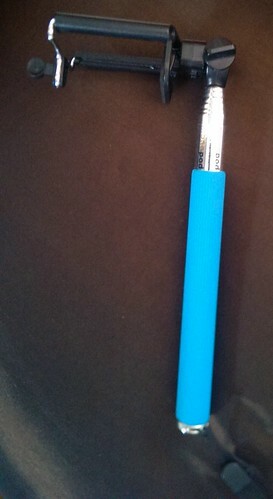 The stick (or monopod) helps you to take photos from different angles, and to reach things in difficult positions. In short, they are great for helping to take holiday snaps. The stick – unextended (left); partially extended (right). I thought that selfie sticks were probably well-known and it was only me that hadn’t heard of them, but our friends were as intrigued as we had been when they saw the stick. It is basically a telescopic pole, with an adjustable grip at one end into which you can slot a mobile phone and then adjust the angle. Provided your phone’s camera has a timer on it then you can use the stick to take photos of yourself from a distance that doesn’t make you look scary, unlike typical selfie photos. On the beach in Boracay, Philippines. OK, so I do look a bit scary here but that’s only because I am squinting due to the sun. If pressed I would have guessed that the selfie stick started in the Philippines, which has a real love affair with mobile phones and communications tools. 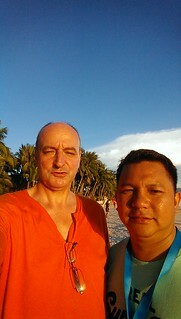 The Today programme suggested that it may have started in Indonesia and that it was somehow associated with extreme sports. A piece from March this year in the Huffington Post confirms that the sticks are very popular in Indonesia, Malaysia and the Philippines. I’ve not looked to see if they are on sale in the UK, but you can find them on Amazon. It’s this year’s must-have Xmas stocking filler.